The favourite festive short struggles in a two hour adaptation. 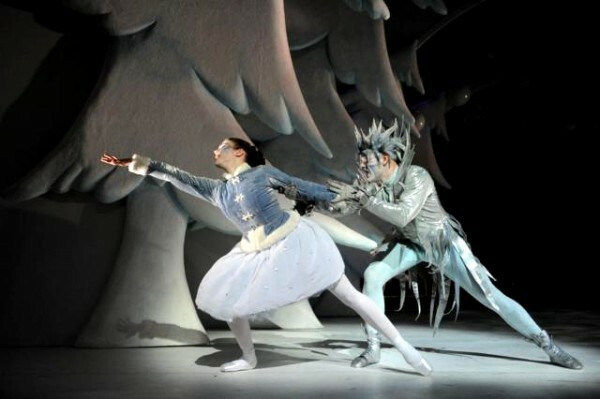 Raymond Briggs wrote the picture book The Snowman in 1978, the subsequent film has been shown annually since 1982, and Robert North’s 1993 stage version has appeared at Sadler’s Wells’s Peacock Theatre every Christmas since 1997. It is billed as a major charm offensive but, perhaps because I know the film too well, or am simply too old for such a children’s treat, it didn’t light up my Christmas tree as I had rather hoped it would. There are three problems with transferring this story of a boy who sees the snowman he builds come to life from a twenty-five minute classic film to nearly two hours on the stage. First, the subject matter is really too thin to merit it. To watch the youngster James stamping like a giant in the snow for a few seconds is fine, but stringing this out any longer simply makes the action feel overblown. Similarly, it is a lovely touch to see the Snowman cooling himself by the fridge, but the joke is taken too far by seeing a pineapple, coconut and banana spring from it to perform a dance routine. Second, there are certain visual effects that cannot be reproduced on the stage. The humour in watching the Snowman put false teeth in his mouth is lost when he is wearing a thick furry costume and can only place them on top of his face. We also lack any close-up shots meaning that intimate moments, such as when the Snowman stares at a model of himself on the Christmas cake, become lost. It is also hard to have a fast motorbike ride through the snow when it only goes at two miles an hour, which forces this routine to focus on the comedy of startling the foxes, hares and badgers, rather than the mystery and magic of a night time trip through nature. Even the famous Walking in the Air song falls a little flat because, although the pair do rise into the air, they spend a lot of the time just treading ground there. Third, the pathos in the original – this is a lonely only child living in the middle of nowhere – is difficult to reconcile with a feel-good Christmas show. As a result, this important element is lost, and the final image isn’t of the sadness felt by James as he stands over his melted Snowman. But this is still a piece that should appeal tremendously to children, for whom ironically the length will prove far more suitable. While adults may get irritated if a dance routine goes on one minute too long, when youngsters take to something it is simply a case of the longer the better. In this way, Act Two proves an enjoyable experience (for everyone) as it sees snowmen, penguins and Father Christmas dance throughout. If you really want to marvel at the prowess shown by dancers in bulky costumes the Royal Opera House’s Tales of Beatrix Potter might be a better bet, but these routines do grant fun in abundance. Each snowman has its own personality – there are Chinese, Scottish, Cowboy and Fred Astaire characters – while Father Christmas and two dancing penguins provide additional variation. Two characters – the Ice Princess and Jack Frost – were introduced to the show in 2000. They bring further fire to the mix, particularly since Emanuela Atzeni and Giuseppe Lazzara wear slender costumes and contribute some more serious ballet. Lazzara’s Frost is all spiky insouciance while there is something deeply affecting about watching the sleek Atzeni dance with the more galumphing, but loveable, Snowman (shared by Remy Martyn and Brad Madison). As the Snowman and Frost grapple over the Ice Princess it feels like Siegfried and Baron von Rothbart fighting for Odette at the end of Swan Lake, although never before have I seen Rothbart defeated by being head-butted by a Scottish snowman! Howard Blake’s music, which combines extensions of his original film score with new compositions, is as magical as ever, while the set possesses a pleasing arching quality, the Christmas trees bowing perhaps in deference to Briggs’s creation. The Snowman should prove a brilliant treat for children and, although I hesitate to recommend it to adults thinking of going alone, those who accompany their little ones should enjoy the experience too.